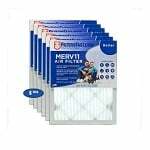 Save from $1-$5 a filter when you purchase these Filtrete filters by the six-pack! When ingested into the human body pollen causes the immune system to produce large amounts of antibodies, which in turn causes chemicals such as histamines to be released. The release of these chemicals causes the body to experience symptoms such as sneezing, runny nose, and watery eyes. When mold found in wood, ceiling tiles, wallpaper, paint, carpet, sheet rock, and insulation is disturbed, mold spores are released into the air. Mold spores can cause symptoms such as sneezing, runny nose, and itchy or watery eyes. A combination of dead skin and dust mite feces, this debris lives in our beds, chairs, couches, and our children's stuffed animals. Dust Mite Debris is almost as effective as pollen at causing symptoms such as sneezing, running nose, and watery eyes. Cigarette, cigar, fireplace, and wood burning stove smoke contains very tiny particles composed of wood tar, gases, soot, and ashes that can cause severe irritation and allergic reaction in some people and even trigger bronchitis or asthma attacks in others. Smoke also contains carcinogens which could also lead to lung disease and cancer. Pet dander is comprised of tiny pieces of skin that come off of your dog or cat when they scratch. This dander either floats, suspended in the air or stick to whatever they land on. Allergies to pet dander can be very serious including symptoms such as swollen eyes and throat, watery eyes, runny nose, sneezing, coughing, wheezing, or even asthma attacks. Dust accumulates everywhere in your home; carpets, tables, TV screens, clothes, walls, etc. Simply walking around in your home may disturb or "stir up" dust into the air which can irritate your immune system. Even if you live in the remote countryside in a small town with little to no industry chances are the air in your home contains smog. Smog, a combination of smoke and fog, makes its way from urban/industrial areas of the world right to your doorstep on the wind. Breathing in smog for pro-longed periods of time can not only cause allergic symptoms such as watery eyes, and running nose, but also more serious respiratory issues such as wheezing, coughing, asthma attack, and sore throat. Airborne bacteria can be found any and everywhere. While some bacteria is beneficial to us, "bad bacteria" can cause problems such as pneumonia, strep, staph and many other infections. 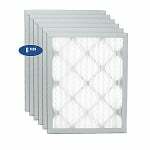 Only the highest quality air filters can remove bacteria and prevent its growth once trapped. Like bacteria, viruses can be found just about anywhere but are rarely helpful to the human body. Viruses can attach themselves to just about any particle and once disturbed can become airborne. Once inside our cells viruses can wreak havoc on our immune systems with diseases from everything from the common cold to the flu and chickenpox, to Ebola. Avoiding viruses wherever possible is always a good idea. 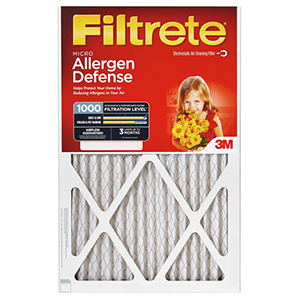 The 3M Filtrete Micro Allergen Air Filter lasts 3 months and meets the Meets the American Lung Association Health House Indoor Air Quality Guidelines. 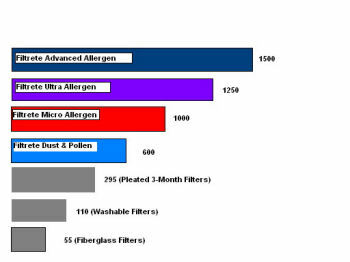 MPR or Microparticle Performance Rating represents the effectiveness of a filter at capturing the smallest airborne particles measured in the industry standard test. 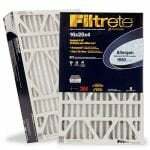 This Filtrete filter received an MPR of 1000. Merv 11. Installation instructions included on packaging.